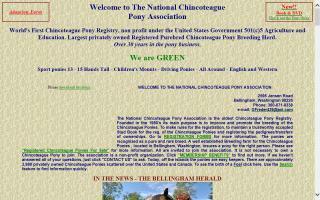 Chincoteague Pony Breeders and Stallions Directory - O Horse! We are a self owned and operated Chincoteague Pony breeding farm. We currently own one stallion and one mare - both Island bred. Our stallion is open for breeding to outside mares. As of May 2008, he has three babies on the ground, ranging from 1-5 years. He produces great conformation with solid looks and great temperaments. Please contact us with any questions. World's first Chincoteague Pony registry. Founded in the mid 80's with three Chincoteague ponies purchased at the Chincoteague Island, VA's pony auction in the mid 1970s. Chincoteague Pony farm in Belllingham, WA. Sell ponies, register ponies, and please join the Chincoteague Pony Club and become a member. We are a non-profit organization - giving back to America. Chincoteague Ponies for sale. Chincoteague stallion available for stud. Training available for all breeds. Boarding available for all breeds. We raise and sell rare and authentic registered Chincoteague Ponies.